Using the best portable water filter will dramatically improve your hiking and camping experience. First of all, once you start using a filter you won’t have to carry a lot of water with you at any given time. You can simply use the filter to refill your water recipient as you go. Second, you will actually lower your travel expenses. Instead of buying water at the start of the trail at exorbitant prices, you can simply use the filter to make the water you encounter on your trip drinkable. And the best thing is, the models we present in the following portable water purifier reviews can make almost every source of fresh water drinkable. In the following article, we take a look at some of the top portable water filters you can use on the run and reveal their pros and cons. 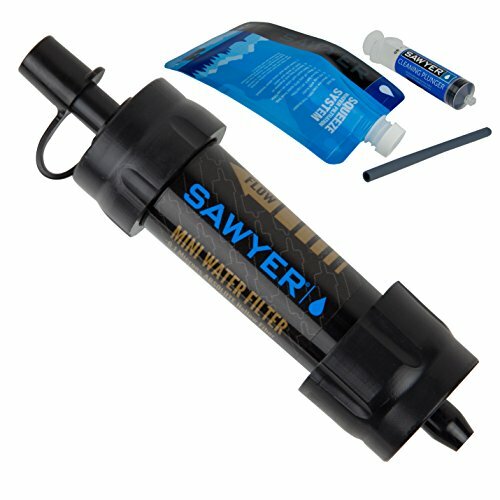 The Sawyer mini filtration system is a compact water filtering solution for those who enjoy camping, hiking and traveling. Even though it’s small, this water filter is extremely efficient and it will remove up to 99.99% of the parasites, bacteria, and viruses in the water. The filter is also very durable. A single filter cartridge can clean up to 100,000 gallons of water without needing a replacement. One of the things we liked about this model is that it comes with a great adapter. The adapter is small and versatile, and you can attach it to water bottles, water pouches, or even to faucets to improve the quality of your drinking water. Squeeze Bags Can Burst – The water filter comes with a squeeze bag that makes the water filtration easier. However, the squeeze bag can burst unexpectedly, so it would be better to pack a water bottle as well. See The Price On Amazon! 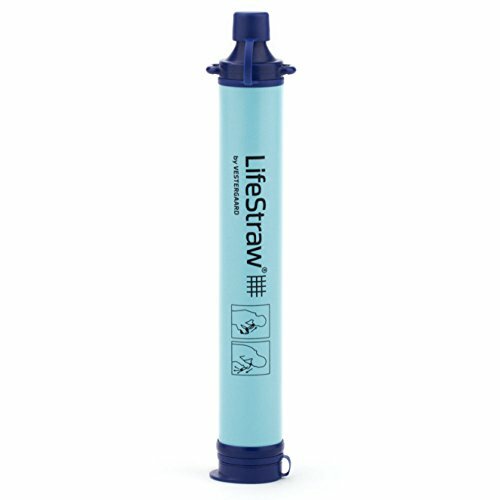 The LifeStraw personal water filter is probably the most popular model available on the market at this moment. This unit is small, extremely easy to use, and it comes at a great price, making it a public favorite. We were impressed with this filter’s intelligent design. Even though it’s small and compact, this water filter can provide up to 792 gallons of safe water without using any chemicals. Moreover, the filter will remove up to 99.9% of the bacteria and protozoa commonly found in water. Another great thing about this model is that it doesn’t have a shelf life. Since the filter doesn’t rely on chemicals to filter out the harmful particles in the water, you can store it indefinitely even after you start using it. Cheap – This model comes at a great price, and it’s one of the cheapest portable water filters available now. 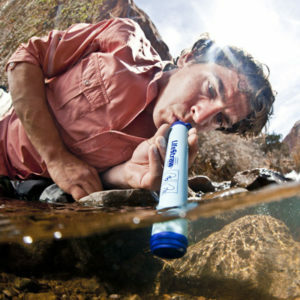 Needs Suction – The LifeStraw needs a bit of suction to get going, and that can be somewhat bothersome when you’re at high altitudes because it can get you winded. 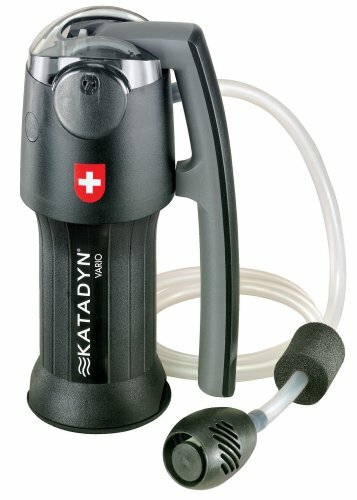 We start off this list with the Katadyn Vario water filter. This unit is small enough to fit comfortably in a backpack and doesn’t weigh too much. Thanks to its efficient filtering mediums, this model is capable of filtering up to 2 quarts of water per minute. One of the things we liked about this model is that it has a well-thought design. This model comes with an outlet and an inlet hose that measure 36” each, and a plastic clip that will attach the hose to your water bottle, preventing it from falling as the bottle fills. The filter’s pump works fast, and you don’t have to put a lot of effort into pumping water. The charcoal filters remove most of the unpleasant tastes and smells, making the water drinkable and good tasting. Pump Can Stop – The piston and valve assemblies do a great job at pumping the water fast, but they can get air-locked at times. The Sawyer PointOne is a complete water filtration system suitable for those who are passionate about hiking, camping, and traveling, but it can also be a valuable asset for those who want to be prepared in an emergency situation. This model can remove more than 99.9% of the bacteria and protozoa that live in the water, so it will allow you to drink from any source of fresh water you discover. One of the things we liked about this model is that it comes with an ingenious adapter. 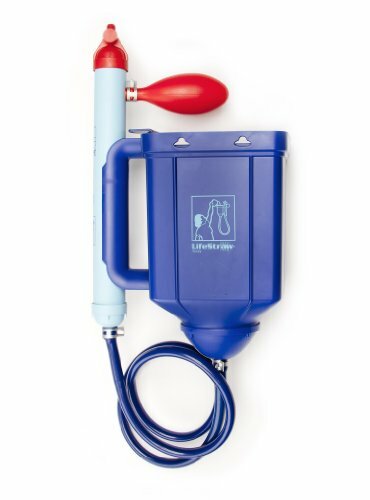 You can connect the adapter to the 32-ounce pouch and use it to transfer the filtered water from the pouch to your drinking bottle, or you can use it to connect it to a faucet or a bucket and filter the water in an emergency situation. Long Lasting – You can use the water filter for a very long time. This model can filter up to 1 million gallons without needing a replacement filter cartridge. 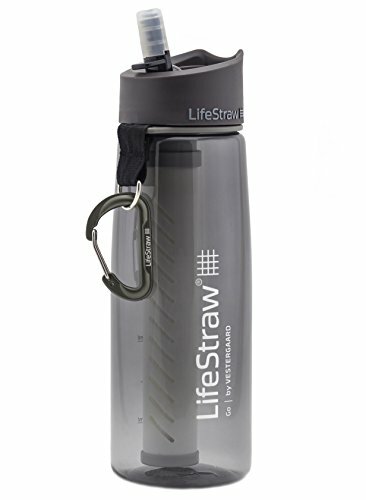 The LifeStraw Go water filter bottle is a great model for those who enjoy backpacking, camping, and traveling, but it can also be a good addition to your emergency kit. 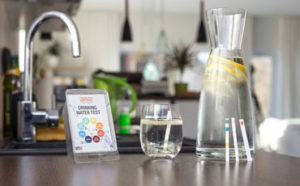 This water filter uses a 2-stage activated carbon filter cartridge to remove any foul tastes and smells, and it uses a hollow fiber membrane to remove 99.99% of the bacteria and protozoa in the water. We liked this water filter’s design. The water bottle is made out of BPA-free plastic, and the mouthpiece is made out of soft silicone, making it very comfortable to use. You can remove the mouthpiece and use the plastic container as a normal water bottle when you’re confident the water is safe to use, and you can attach the mouthpiece and filter the dirty water when you have to. A single straw filter can clean up to 264 gallons of water. When the filter reaches its limit, it will stop taking in water. Easy To Use – This portable water filter is really easy to assemble and use. Poor Quality Control – Some customers complained that their water bottles leaked. If this happens to you, contact the manufacturer for a replacement. 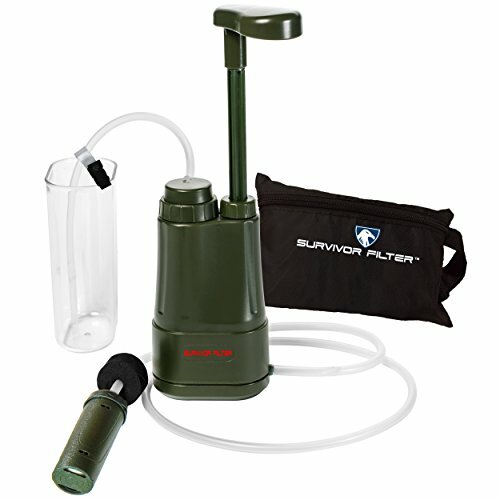 The Survivor Filter Pro is a small and compact water filter that can remove most of the contaminants in the water. This model is very efficient, and it will remove 99.9% of the bacteria and viruses in the water, and up to 99.5% of the heavy metals that frequently contaminate water. The filter will also remove protozoa and parasites. We were impressed by how fast this small water pump manages to filter the water. The filter can produce up to 17 ounces of fresh water every minute, and it comes with all the necessary accessories to make the filtering process easy and straightforward. A single bacteria filter cartridge can clean up to 100,000 liters of contaminated water, so it’s safe to say you can use this water filter for a long time. Good Flow Rate – This model can produce up to 17 ounces of clean water per minute. Dirty Lines Can Contaminate The Clean Ones – There is no way to separate the dirty lines from the clean ones, so the first can contaminate the latter. The LifeStraw Family water purifier is a great filtering solution for those who like to like to spend their time in nature, and it’s also a helpful tool in your emergency situation kit. This model uses a gravity filter. 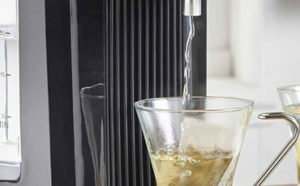 You simply pour the water in the unit’s top and it comes out filtered out of its bottom. As far as the filter’s efficiency is concerned, this model will remove up to 99.99% of the bacteria, viruses, protozoa, and parasites that live in the water. The filter also works quickly, and it’s capable of purifying up to 12 liters (3.17 gallons) of water per hour. We were impressed by the filter’s large capacity. With a filtering rate of up to 3 gallons per hour, this model cleans enough water for a small family or a group of friends who camp or travel together. Missing Parts – Many customers complained that their packages didn’t contain all the accessories they should. If this happens, contact the manufacturer’s customer support service for replacements. Drinking clean water should be one of your priorities, no matter your location. Whether you’re camping in the mountains or traveling in foreign countries, you should always make sure that the water you drink is clean and healthy. Portable water filters offer an easy solution to this problem. These models are small enough to fit in a backpack, and they’re efficient enough to clean every source of water. But finding the right portable water filter can seem like a daunting task at times. There are a lot of models available on the market, and it’s difficult to tell which can perform better than the other. In the following section, we explain how to choose a water filter, how a water filter works, and why you should use such a filter when you’re traveling. There’s no point in buying a portable water filter if it’s uncomfortable to carry around when you travel. You should always take the filter’s weight into consideration before deciding on a model. Most portable water filters are small and compact, but their weight can vary according to their design, filtering technology used, and their construction materials. Every portable water filter will remove the contaminants from the water at a specific rate. Some of them will produce a couple of ounces of clean water every minute, while others can produce nearly 20 ounces of water in the same timeframe. Using a unit that’s capable of filtering the water quickly can be an advantage if you plan on traveling or camping with a large group of people. Like it or not, every filter cartridge has a limited lifespan. Some models might last for a few days, while others can be used with good results for a few weeks or even months. However, the highest quality portable filters use long-lasting filter cartridges. Some models will allow you to filter up to 264 gallons of water with a single cartridge, while others will clean up to 100,000 gallons of contaminated water. Despite the fact that they are small and compact, not all portable water filters are easy to use. Some models come with detailed installation and priming instructions, and you might have to take the instructions with you when you travel to make sure you set them up properly. Other models are extremely simple to use, and you simply have to draw water through them and drink it, as if you were using a straw. The best approach to finding a water filter that matches your budget is to set a budget before you start browsing for one. Just like all the other products you can buy, potable water filters come at different prices and buying the most expensive model doesn’t guarantee you’re getting the best model. Plenty of efficient models come at cheap prices, so you can get a small and functional unit at a great price. 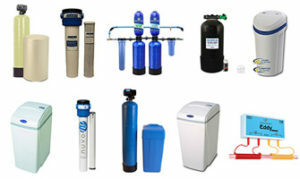 As you could see in our short reviews, there is more than one type of portable water filters. Even though they lead to the similar results, each type filters the water in its own way. Let’s take a look at how they do it and the pros and cons of using each type of filters. Straw water filters are the lightest portable filtration solution available now. Just like the name suggests, these filters usually look like overly large straws, and they work like straws as well. To use these filters, you just have to get close to the water source and draw in water through the straw. Unlike a regular straw, the filter requires a more powerful draw in order to work, but the filtration process is really easy and straightforward. Straw filters use cartridges made out of hollow fiber membrane. These fibers are tightly woven together, so the water has to pass through a lot of fiber layers before reaching the actual straw you’re drawing on. The fibers are also very porous, but the holes in the fibers are very small. Most membranes use holes that are 0.2 microns wide, so that’s one hundred thousand smaller a 2 cm hole. The water passes through the holes in its way to the straw, but all the bacteria, viruses, and parasites in the water are larger than the hole, and they will be trapped and won’t be able to pass. Pump filters are not extremely small, but they’re still small enough to fit in a backpack without taking up too much space. 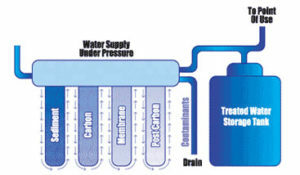 To use the filters, you have to connect a lead line to the water source and another line to a water recipient. You use a small hand pump to draw the water. 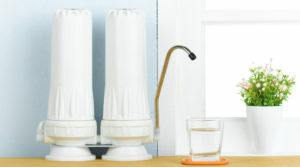 Now, some pump filters rely on ceramic filters, some use fiber filters, and some use one of these filtration techniques in conjunction with an activated carbon filter or even a block activated carbon. The fiber filters work exactly as the straw filters’ hollow membrane filters and mechanically stop the contaminants from reaching your drinking water. 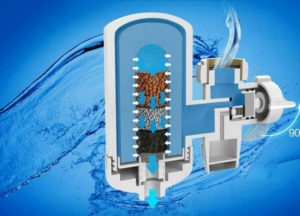 The ceramic filters also provide a mechanical filtration. These filters are also porous, and their surfaces are usually covered in 0.5 – 1-micron holes. The water passes through the small holes, but all the contaminants are blocked. One of the advantages of using ceramic filters is that they can stop the asbestos that might contaminate your water. However, a disadvantage is that some bacteria are small enough to pass through the ceramic filter and end up in your water. Another disadvantage is that the ceramic filter doesn’t stop organic compounds from contaminating the water. That’s why some manufacturers use it in conjunction with an activated carbon filter. The activated carbon has millions of extremely small pores between its carbon atoms. Each gram of activated carbon presents a surface area of up to 2,000 square meters, and the contaminants in the water will be trapped on this surface. Here are the pros and cons of using an activated carbon filter. Bottle filters have the advantage of being useful even when you don’t have to filter your drinking water. You can simply remove the bottle’s filter cartridge and use it as a normal drinking bottle when you’re certain your water source is safe and healthy. When you have to drink from a water source that’s most likely contaminated, you can simply put in the filter cartridge and use the bottle as a filter. Most bottle filters rely on fiber filters to clean the water, but some models use solid block activated carbon filters instead. The models that use fiber filters work just like the straw filters we described earlier, but instead of dipping the straw in a water source, you’re actually using the bottle as a recipient for the contaminated water. The straw will filter out the contaminants and allow only clean water to reach the mouthpiece. Now, the models that use an activated carbon block filter to clean the water use a similar technology to the one we described earlier, only better. In this case, the activated carbon has been treated and compressed to create a uniform matrix. This will allow the activated carbon to absorb more chemicals and reduce the size of their pores, making them more efficient at trapping bacteria and parasites. Effectively reduce the heavy metals, arsenic, and other dangerous contaminants in the water. Gravity water filters are great for campers, trekkers, and emergency preppers because they don’t need electricity or a constant water supply to work. These models are perfect for those who like to travel in remote areas where clean water is not readily available. 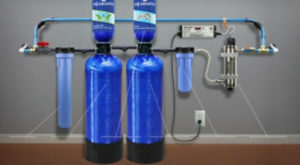 These water filters are usually made out of two containers placed above each other. To use this filter, you pour water in the first container. Thanks to the gravity pull, the water passes through some filter mediums and ends up in the other container which is placed lower. The second container features a tap you can use to refill your water recipient. Gravity filters usually rely on a combination of ceramic and activated carbon filters to clean the water. Thanks to the conjoined action of these filter mediums, the water produced is very clean and free of harmful contaminants. Even though they’re not very frequently used by campers or hikers, there are some good UV portable water filters out there. These models run on batteries, so they will have higher operating costs. One of the advantages of using UV filters is that they’re very effective against bacteria and parasites. Despite the fact that most people use water filters and water purifiers as interchangeable terms, they do not actually mean the same thing. Here’s a short definition of how each of them is different. Water filters are more popular than purifiers, and that’s because they’re more often than not more useful. These filters help remove or reduce the impurities you can find in the water. The impurities they can clean or reduce include but are not limited to iron, nickel, lead, mercury, chlorine, chromium, copper, and more. Although they don’t eliminate all the bacteria and viruses from the water, water filters can effectively reduce their number, and they can eliminate certain species of bacteria altogether. As a rule of thumb, the term water purifiers refers to the units that can remove all the bacterial, viral, and parasitical contaminants in the water. These models will do a great job of removing any bacteria, viruses, protozoa, and parasites in your drinking water, but they won’t remove any other contaminants. This is why water purifiers are more difficult to find. Most manufacturers prefer to develop purifiers that work in conjuncture with a water filter, so the models they develop will be able to remove both the bacteria and the sediment and chemicals that might contaminate the water. As you can see, there are many types of water filters, but are all of them efficient in every possible scenario? 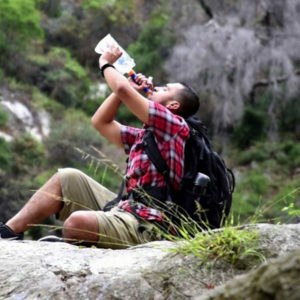 Let’s take a look at some of the best backpacking water filters in regards to backpacker types. 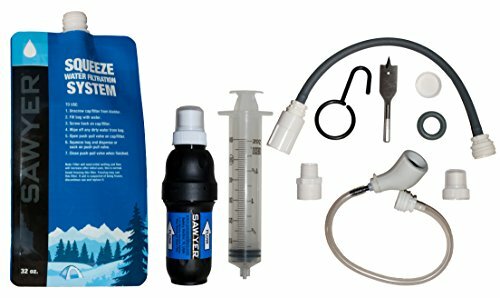 Wilderness Backpacker – If you’re one of the people who enjoy spending a lot of time in the wilderness, you probably know by not that you need a water filtering solution if you’re planning on spending a lot of time outdoors. Sure, boiling the water is also a form of treatment, but water boiling is by far not the most effective treatment solution. Pump water filters are great for wilderness backpackers because they can filter a large quantity of water in a short time, giving you the possibility to pack your daily ration of water in a matter of minutes. 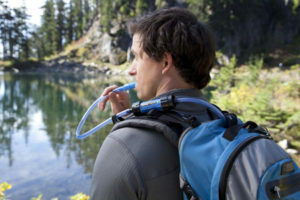 Ultralight Backpacker – If you enjoy trekking and hiking, but you don’t like carrying a large backpack when you’re exploring the sights, you should use a straw or a bottle filter. These models are so small they will fit in every backpack. In fact, both of these filter types will most likely fit in a pocket, or you can simply carry them in your hands. Urban Hiker – If you’re an urban hunter, you might end up in some parts of the world that don’t offer easy access to clean and healthy water. If this is the case, you must take the matter into your own hands and purify the water as you go. The right portable water filter choices for urban hikers are pump filters for those who travel in groups and straw or bottle filters for those who travel alone. You can also make a DIY water filter for half the price of other water filters. Whether you’re a wilderness or an urban explorer, having access to clean and healthy water should be your utmost priority. Few things can be as harmful as contaminated water. Sure, you might eat something bad, but while you can easily quench your hunger, you can barely function without water. Legionella pneumophila – This bacteria causes the infection known as Legionnaires’ disease. The infection leads to fever, muscle aches, cough, and it may result in death if untreated. Check out the advantages of owning a water cooler? As you could see in our portable water filter reviews and comprehensive buying guide, finding the right one is not very difficult once you know what to look for. These modes can be installed and primed with ease, and they will transform almost all sources of fresh water into clean potable water. 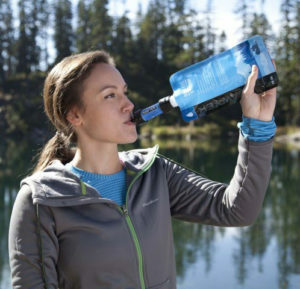 The first thing you should do when looking for the best backpacking water filter is to think of how you’re more likely to use it. If you’re an urban explorer, you might be better off buying a small model. But if you’re looking for a camping water filter, it would be better to choose a model that offers a better filtering rate. © 2019 Water Filter Mag. All Rights Reserved. waterfiltermag.com is a participant in the Amazon Services LLC Associates Program, an affiliate advertising program designed to provide a means for sites to earn advertising fees by advertising and linking to amazon.com.